A panorama of Saint Thomas Church and the panoramic view you get. Stitched from 5 photos. Click to view larger. 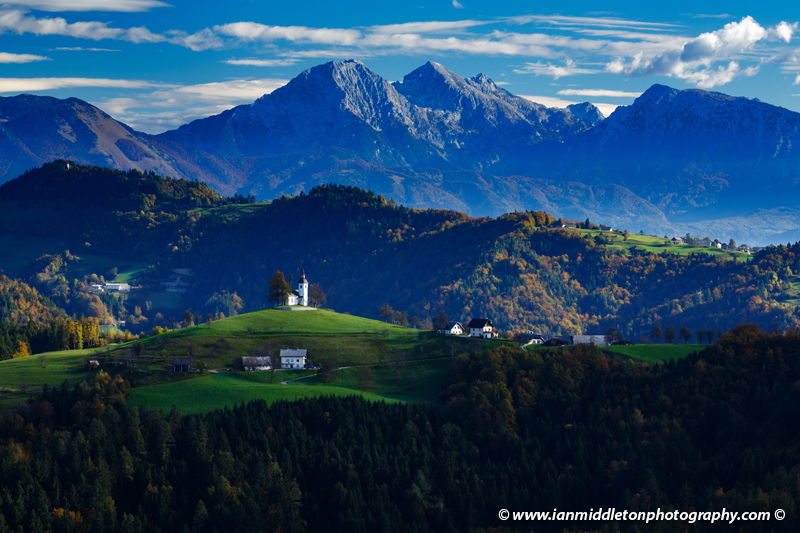 Saint Thomas Church (Sveti Tomaž nad Praprotnim) in the hills of Northern Slovenia is an iconic view, and although one of many well photographed locations, it’s also one of the least well known places to visit in Slovenia. It’s only photographers and locals who seem to know about it. 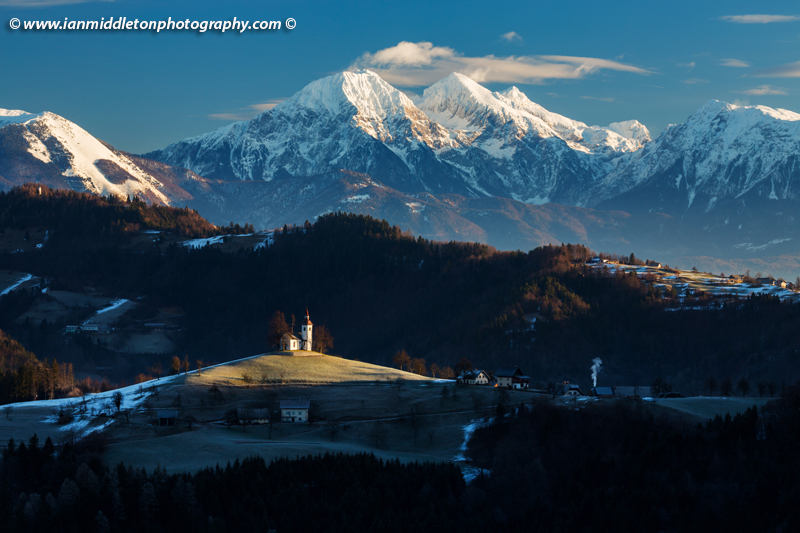 This particular viewpoint is a popular spot from which to photograph it, and the exact location was given to me by Slovene photographer Luka Esenko, co-founder of Snapp Guides. Once I had the location, I visited it many times in the mornings. It’s a morning shot, as the sun rises and illuminates the church from the right. In the early morning in winter, as the sun is further south, the first place it hits is the church itself. I wouldn’t have believed it possible had I not seen it for myself. Unlike many great photographic viewpoints, this view is easy to get to and is a roadside shot. Quite useful for when you get there early: no need to leave much earlier in order to hike out. It’s a 45-minute drive from the capital, Ljubljana via Skofja Loka. The viewpoint is a place called Rantovše hill. To get there go through Skofja Loka and head on towards Železniki then take the turn off for Spodnja Luša. Keep driving and you will eventually see a sign on the left for Rantovše. Head on up this twisty road until you see the viewpoint, a grassy layby on your left. Saint Thomas Church is a morning shot, and best in winter but also good other times of the year. It’s best in winter because the sun is further south and rises directly to the right of the church. This is when it illuminates the church and hill from the side. 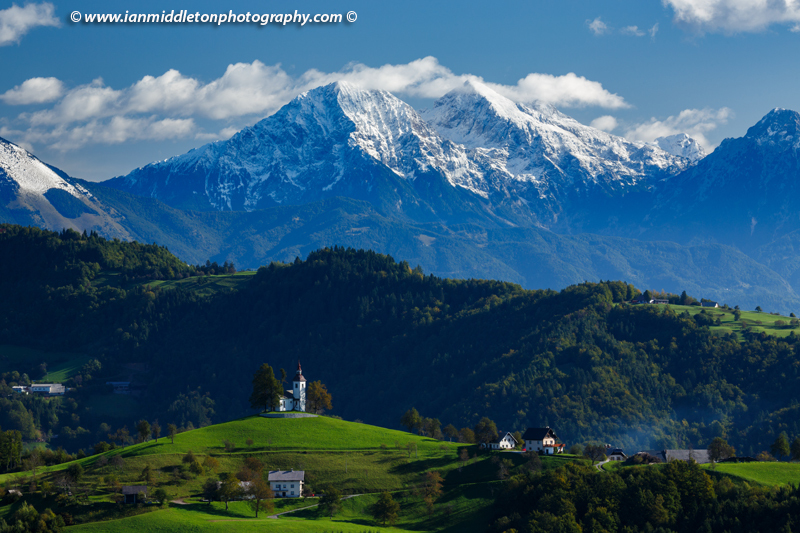 In late Spring and summer, as the sun moves more north, then the sun rises behind Grintovec Mountain. 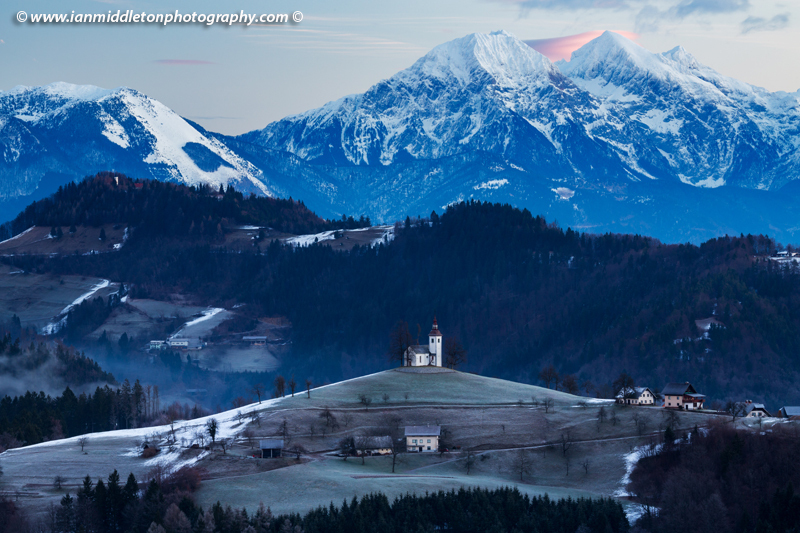 View at sunrise in winter from Rantovše hill across to Sveti Tomaz nad Praprotnim (church of Saint Thomas) and the Kamnik Alps, Slovenia. 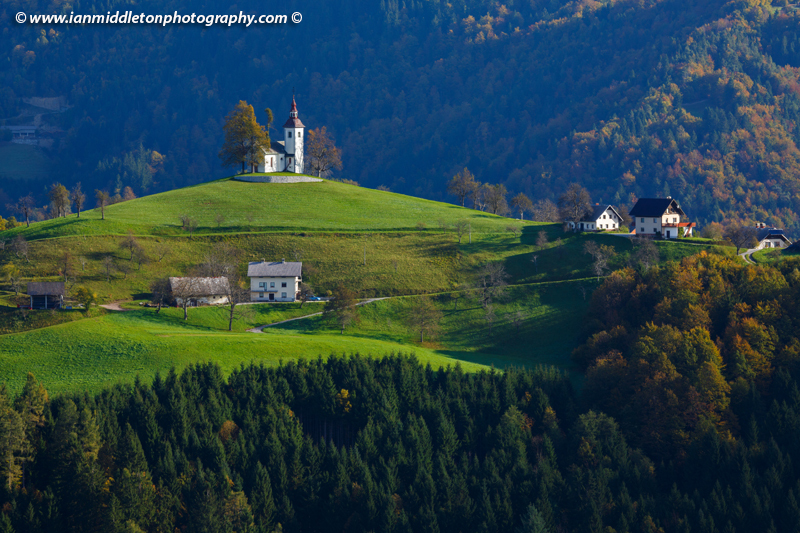 Unlike Jamnik Church, Saint Thomas Church is not lit at night so there isn’t the possibility of that classic shot at dusk or dawn. However, it can still look good at dawn in the right conditions. 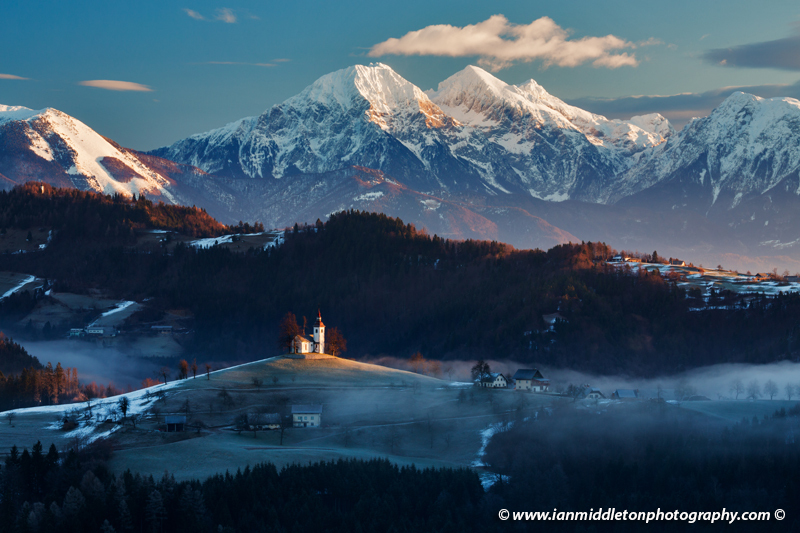 View at dawn in winter from Rantovše hill across to Sveti Tomaz nad Praprotnim (church of Saint Thomas) and the Kamnik Alps, Slovenia. Sunrise in the summer represents a whole different story. 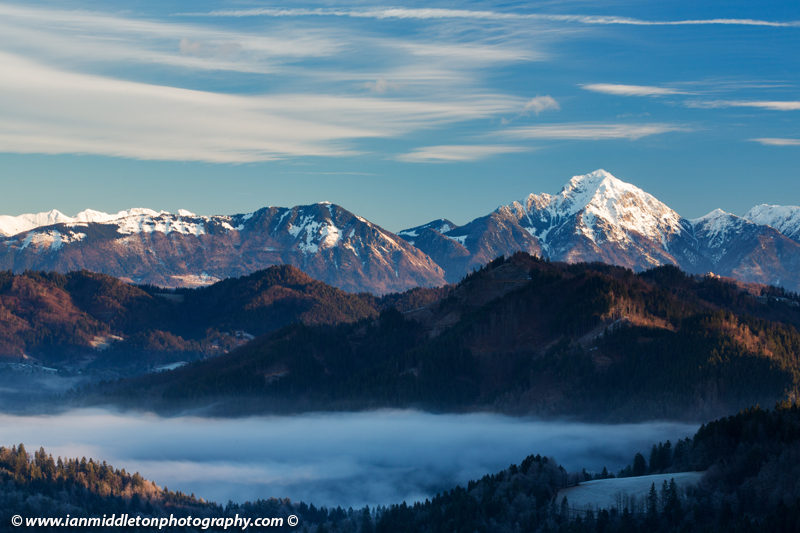 At this time of year the sun rises further to the north and up over the mountain peaks. But even in the summer with the right kind of weather it can be an amazing scene. I planned a shoot after a day and night of rain, where the forecast conditions looked right. I was not disappointed. 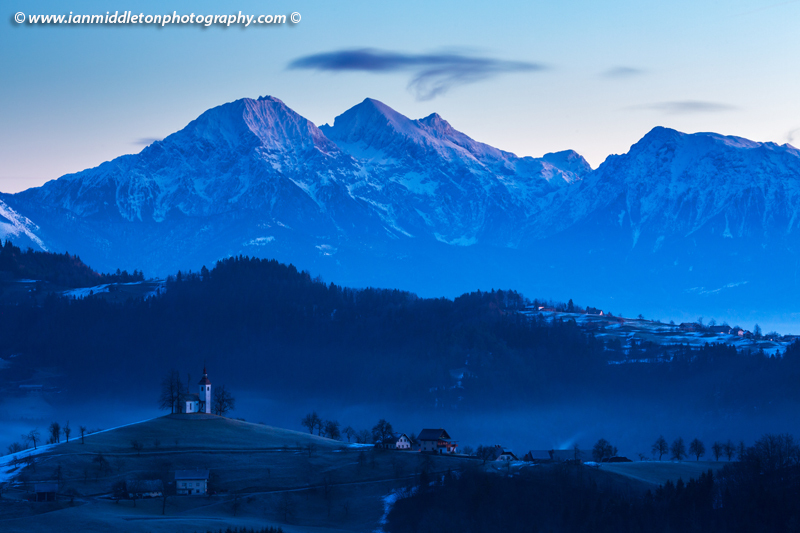 View at dawn from Rantovše hill across to Sveti Tomaz nad Praprotnim (church of Saint Thomas) and the Kamnik Alps, Slovenia. 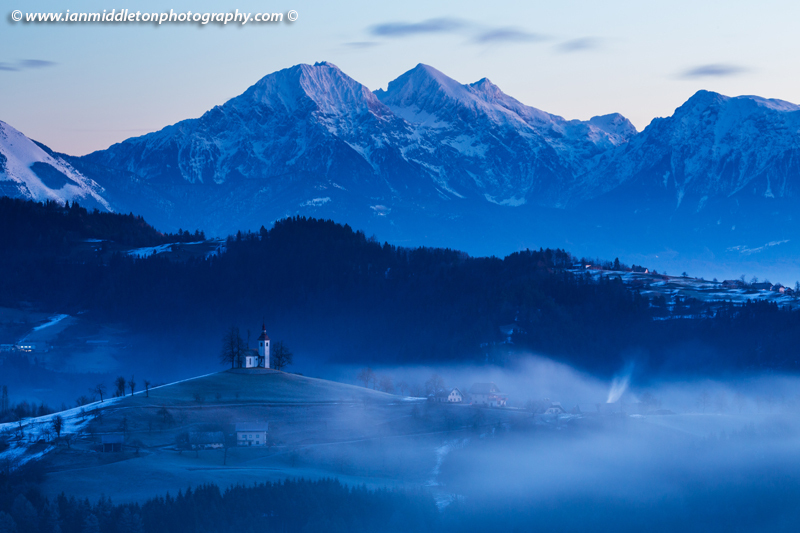 Wider view at dawn from Rantovše hill across to Sveti Tomaz nad Praprotnim (church of Saint Thomas) and the Kamnik Alps, Slovenia. 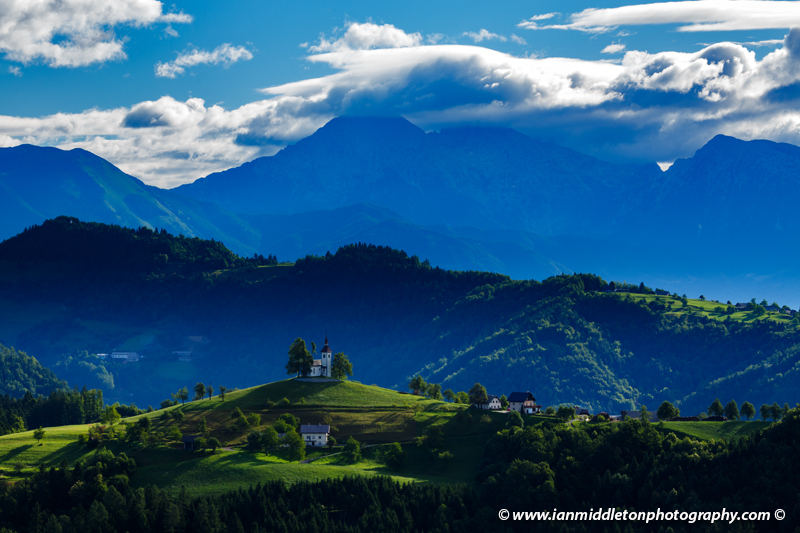 Summer sunrise from Rantovše hill across to Sveti Tomaz nad Praprotnim (church of Saint Thomas) and the Kamnik Alps, Slovenia. 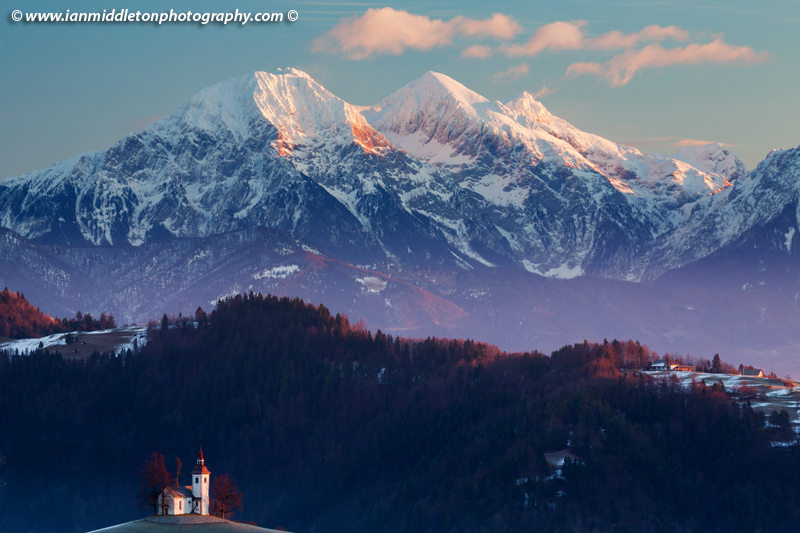 Sun rising over the Kamnik Alps from Rantovše hill across to Sveti Tomaz nad Praprotnim (church of Saint Thomas) and the Kamnik Alps, Slovenia. Okay so it looks great at sunrise, but a classic view like this also looks great throughout the day. If you can’t get there for sunrise, then it can still look great throughout the morning if the light is right. 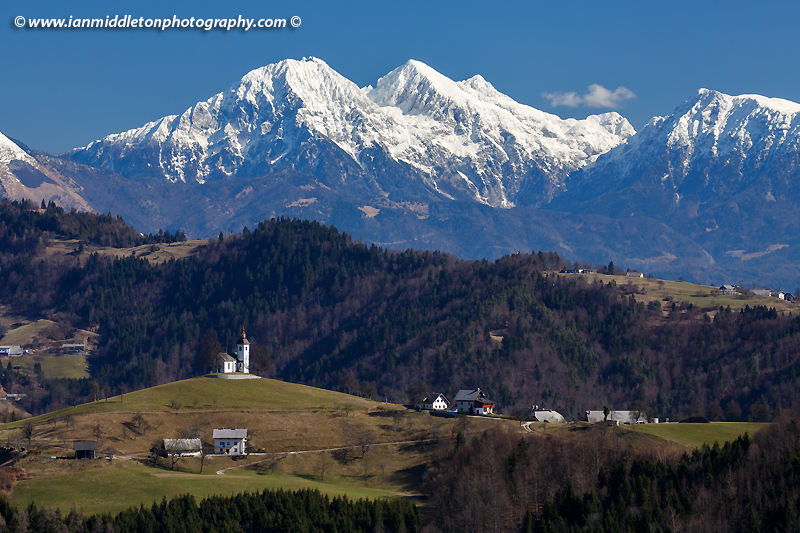 While Saint Thomas Church and the Kamnik Alps as a backdrop is without doubt the focal point of the view, the Kamnik Alps, and especially Mount Storzic, alone can make a great photo., This viewpoint also boasts great views across to the Karavanke Mountains to the west. So make sure to point your camera is that direction on occasion. 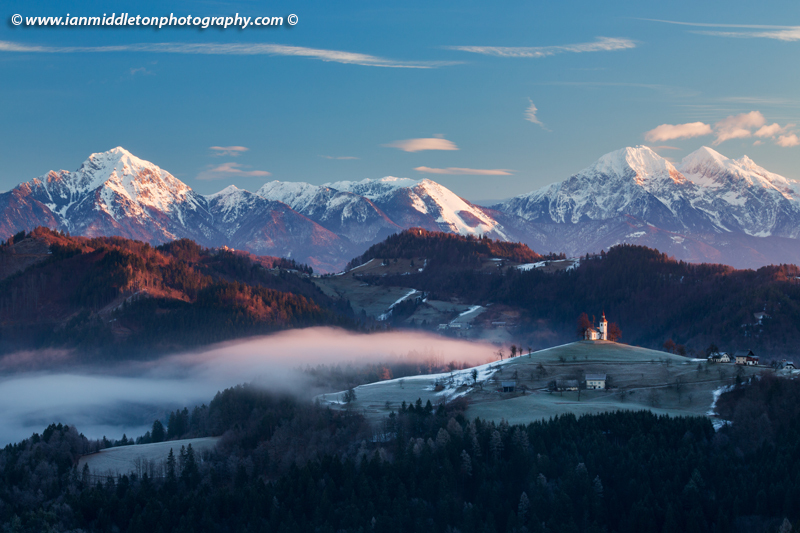 View across to Mount Storzic at sunrise from Rantovše hill near Skofja Loka, Slovenia. 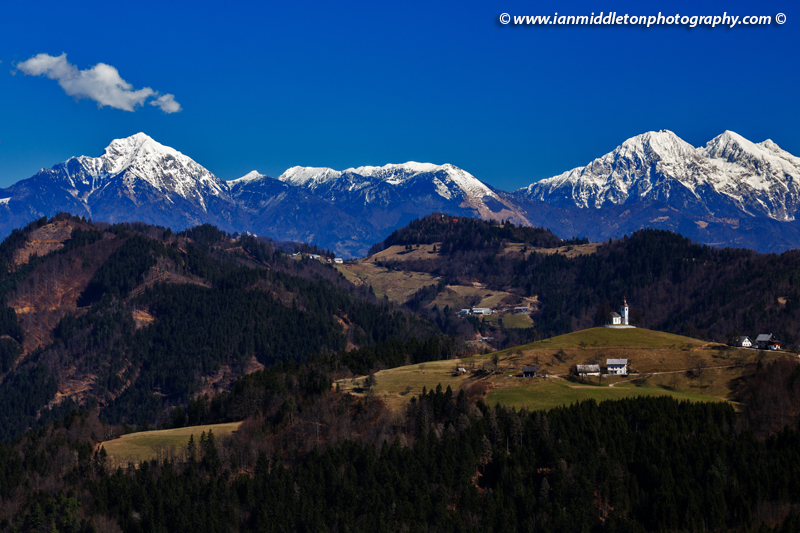 View from Rantovše hill across to Mount Storzic in the Kamnik Alps, Slovenia. 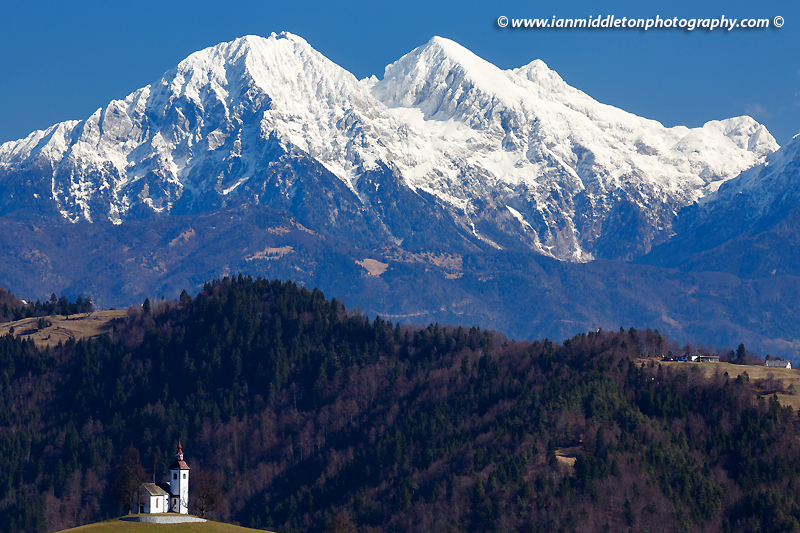 Mount Stol in the Karavanke Alps in Slovenia. 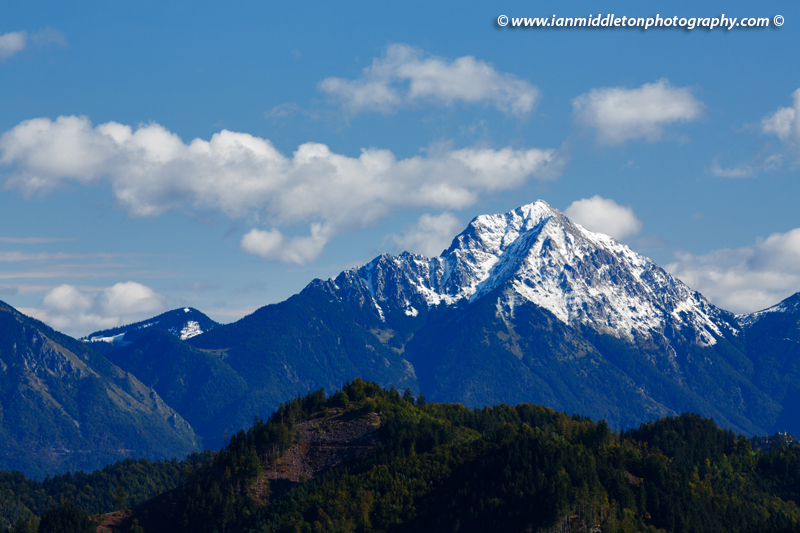 This was just after a long period of rain in September, which produced some early snow on the mountain peaks. This is the map you will need in order to get to the photo viewpoint. To get there go through Skofja Loka and head on towards Železniki then take the turn off for Spodnja Luša. Keep driving and you will eventually see a sign on the left for Rantovše. Head on up this twisty road until you see the viewpoint, a grassy layby on your left.